Discussion in 'General Discussion archive 2016 (read-only)' started by Roberto Ferdenzi, Mar 10, 2016. Oh, my. I had no idea. Very sad to hear the news. One handsome dude. 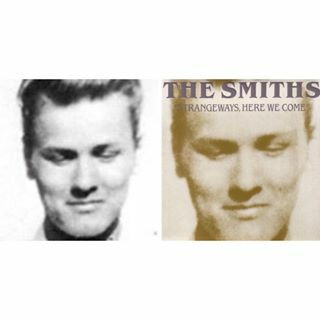 This pic made one hell of a Smiths cover art, even if it only made it's way to the Best... l & ll compilation and The Complete Picture. Certainly someone who has printed one of the most beautiful images as we know to The Smiths. He looked great in his short scenes in Cool Hand Luke. He was massively under used in that film. by way of thanks for your magnetic performance here in Los Angeles. It was a truly remarkable evening. You are so very special. RICHARD. Richard's ring fastened itself to my finger for the next few years, until I suddenly wondered what it was doing there." Morrissey in his gorgeous glory. There won't be another one, so soak it in while he is around. Long live S.P.M. Is there a picture of Moz wearing this ring? I don't get it. So the two were engaged? I know Moz and Damon are engaged or married by now. So Moz is giving it another go then. The Ringmaster! The Lord of the Rings! The Ringleader of the Tormentors! It's come full circle. I hope he's good to Damon - he seems sweet and must have the patience of Job to endure that infernal swine and his demands. is east of eden worth watching? i watched rebel without a cause recently and it was kind of silly. james dean looked like he could've been someones dad not a high school student. but the thing i got out of it was the surprise discovery that james dean actually seemed very likeable. there was something touching and poignant about him which i wasnt expecting. i think moz's affection for him is rather sweet and i love that picture someone made of the two of them. I saw him and Britney at a party when he wasn't all that famous yet. She had really thick legs, and he still had that nasty NSync permfro. Amazing how ugly some celebrities are in person. George Clooney was gross up close. Morrissey is probably better looking in person - he seems to have that aura about him. Personally, I find East of Eden the best James Dean film. It's based on John Steinbeck's biblical allegory — Genesis replayed in Monterey, California, circa 1917 — which is more palatable on the screen, thanks to the down-to-earth performances of James Dean as Cal/Cain and Richard Davalos as Aron/Abel. Just avoid Giant, which is mostly awful. East of Eden is the better film (in my opinion). Rebel Without A Cause is only worth watching for the amounts of coded gay symbols in there (read The Celluloid Closet, and then watch it again and it's surprisingly blatant). Giant is also worth a watch, if only the complete the Dean trifecta. At least James Dean was attractive. And Brando requires subtitles.